We exist to support the cultivation and enjoyment of Native Plants within northwest San Diego County and to provide community education on the benefits of Native Plants. The Buena Vista Native Plant Club is a loosely organized group that meets every Monday at 10am at the Nature Center to take care of the grounds, propagate California natives and learn from each other. All tools and gloves are provided. Come any Monday ready to work, no notice required. Every year in April, we sponsor a 1.5 mile walk through the Seaside Neighborhood near downtown Oceanside. Check events calendar for date. The front of Cream of the Crop Grocery on Coast Highway was landscaped by us as a great example of how native plants can look great on a busy street! We worked with Surfrider Ocean Friendly Gardens to host a class on how to build bioswales. The class planted the side of the Econo Lube on Vista Way to harvest all of the roof drainage on the south side. We planted 500ft of a hot slope on El Camino at Mesa Drive by working with FriendsofElCorazon.org and the City of Oceanside.It is watered only by a drive spray from a water truck once a month. We planted the front of the Cemetery on Coast Highway near Oceanside Blvd. The southern slope of the Brooks St bridge over I-5 was also planted by us to help kids at the after school program learn about natives. In addition to maintaining the native habitat and planted areas of the Nature Center, the club supports 8 school gardens with regular teaching and/or free plants. Contact us (below) if you would like to support this effort or come to learn how to start a garden at your school. The current gardens are: Oceanside (Mission Elementary Wed 9am, Laurel Elementary Wed 10am, South Oceanside Thurs 2:30 pm, St. Mary by the Sea, Ditmar), Vista High School stadium slope, Winston School Del Mar. For questions or to volunteer, contact the plant club at BVNPC@sbcglobal.net or leave a message at the Nature Center (760-439-2473) for Joan Bockman. The Nature Center has a very good library of books about California Natives. We have events every month and we would love for you to join us! What is a Native Plant Garden? Our coastal hillsides are covered with plants that some people call weeds, but anyone who takes time to learn about these "weeds" soon finds a vast number of attractive and interesting native species that would make great additions to their gardens. San Diego Coastal Sage Scrub rivals the rainforest for the diversity of plant and animal life! The BVAS native plant garden is a small scale demonstration habitat that showcases these native species and increases our understanding of the world as we observe the web of life in action. Native plants are those plants that have evolved here, not those introduced by man. When a plant has been introduced within the past few hundred years, the necessary adaptations haven't had time to occur. Often native species are lost as the new plant takes over. Pampas grass is an example of an introduced plant. It does not provide food or shelter and has destroyed native areas. Isn't it Hard to Maintain? Native plant gardens are easier to maintain than ornamental gardens once you understand them. The plants rest during Summer/Fall and grow in Winter. If native plants are watered in the late summer, the dormant season is interrupted and harmful bugs and microbes continue to multiply. It is best to let the garden dry out for one month during August. The growing season starts with the rains in October. Pruning is twice a year in January and August. 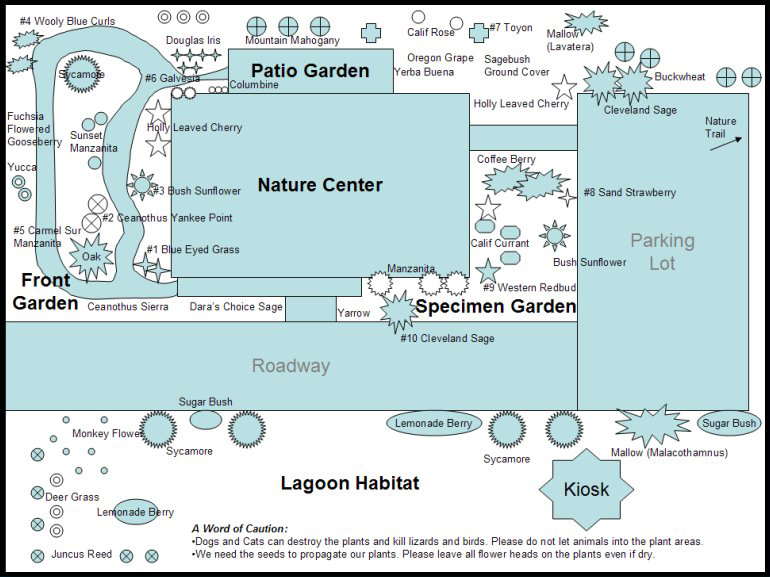 Please only donate tools that are nearly new or "gently used"
The Nature Center garden is made up of 3 zones. The street frontage of the building is intended to show a large scale native landscape that simulates a riparian scene. The entrance to the building is surrounded by a specimen garden that showcases various plants. The back patio area demonstrates a smaller "condo" garden. Directly adjacent to the lagoon, plants are selected more for compatibility with the lagoon ecosystem. This area is more of a habitat than a garden." Sagebrush Artemisia californica "Canyon Grey"
Here is contact info for the native plant landscape designers who volunteered at our native plant tour. Everyone on this list is well known and very capable with native plants.